Let's all mentally send love and wonderful Disney wishes to Ashley, okay? (If you haven't been updated, read yesterday's post with all the awesome Disney pictures.) I know I am. She's such an amazing friend. I love her to death and back! 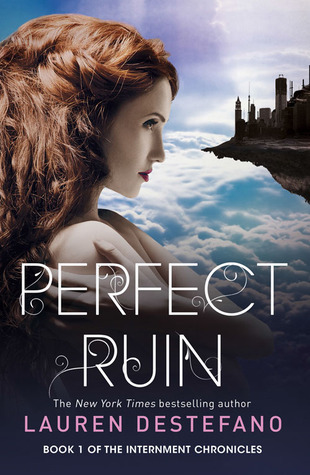 Anywho, today's review is for Perfect Ruin by Lauren DeStefano, who also wrote The Chemical Garden Trilogy, another amazing set of dystopian novels (expect a review in the future). I love that she did the trilogy, then moved on with a different future world with different issues and people and solutions. Many authors are so repetitive in each novel , so I truly appreciate this talented author. Summary: "On the floating city of Internment, you can be anything you dream. Unless you approach the edge. This book is so interesting and cool. The idea of a floating piece of land that is so because of unclear reasons is so cool. Then there's the characters, who are all so unique and whole in their own ways. You'll be surprised and taken aback by the wonderful way this novel is written, and you'll also be thinking over our governmental rules and regulations, as well as the thoughts and facts you take for granted. The storyline is brilliant, by the way. The whole society seems so real and practical, as do the characters. I just have had no issues with this book. It unexpectedly sucked me in right away, and I was hooked. I also got tons of quotes -- serious and funny -- from here to put in my quote book! In Conclusion: Read it! It's original, and it makes you truly think. So go for it!